WASHINGTON — Incendiary rhetoric has seeped into 2016 presidential politics, surfaced in the public debate over accepting Syrian refugees into the U.S. and popped up repeatedly following terror attacks in Paris and San Bernardino. “Advocates are certainly reporting to us an increased concern around incidents, threats and potential hate crimes that they’re bringing to our attention,” Vanita Gupta, the head of the Justice Department’s Civil Rights Division, said in an interview with The Associated Press. But the spectrum of hateful expression is broad, encompassing acts that are clearly illegal — such as firebombing a mosque — as well as vague and distant threats that, while noxious, might well be protected by the First Amendment. WHAT DO FEDERAL LAWS HAVE TO SAY ABOUT THIS? The signature hate crime statute — the Matthew Shepard and James Byrd, Jr., Hate Crimes Prevention Act — makes it illegal to physically harm someone based on their race, religion, national origin, gender or sexual orientation, among other characteristics. DOESN’T THE CONSTITUTION ALLOW ME TO SAY WHATEVER I WANT? To a large degree, yes. The First Amendment offers broad free speech protections and permits membership in organizations, such as the Ku Klux Klan, that espouse hateful ideologies. But while the Constitution gives latitude to hate speech and offensive rhetoric, court decisions in the last century have carved out notable — though narrow — exceptions to free speech guarantees and authorized prosecution for language deemed to fall out of bounds. Comments intended as specific and immediate threats brush up against those protections, regardless of a person’s race or religion. So do personal, face-to-face comments meant to incite imminent lawlessness, such as a riot. ARE THREATS AGAINST THE LAW? They certainly can be, but that depends on various factors. Determining what constitutes an actual threat — as opposed to a vague and far-off remark — is a tricky, fact-specific question. In other words, the more specific and immediate the threat, the more likely it’ll be regarded as illegal. “It’s one thing to say, ‘Kill all the Jews,’ versus ‘Kill that Jew who was my kid’s school teacher who gave him an F,'” said James Weinstein, a constitutional law professor at Arizona State University. Justice Department officials say context matters greatly in such cases, making it hard to generalize too broadly. Hateful threats that the target interprets as a joke, or that are discussed among friends but not leveled at anyone in particular, likely would be harder to prosecute federally. “It requires specificity, it requires intent and it requires a certain sense of imminence,” Gupta said. HOW OFTEN ARE SUCH CASES INVESTIGATED? 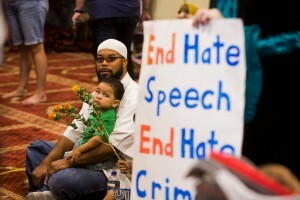 The FBI says local law enforcement agencies reported 5,479 hate crime incidents in 2014. In a Dec. 3 speech to the Muslim Advocates organization, Lynch said that more than 220 defendants had been charged with hate crime offenses in the last six years. Those include a Utah man who threatened an interracial family with death and a man who admitted tying a rope around the neck of a James Meredith statue on the University of Mississippi campus. Since Sept. 11, 2001, the attorney general said, the Justice Department has headed more than 1,000 investigations into acts of “anti-Muslim hatred” and bigoted behavior, leading to more than 45 prosecutions — including of a New York man who e-mailed death threats to an employee at the Council on American-Islamic Relations, and of a Texas man convicted in 2013 of threatening to bomb an Islamic center in Murfreesboro, Tennessee. Among incidents in the last two months: a caretaker at a Philadelphia mosque said he found a severed pig’s head outside on the sidewalk, and CAIR, a Muslim advocacy group, reported getting a hate letter with a white powdery substance at its Washington offices. “I think, sadly, that number is going to continue,” Lynch said.